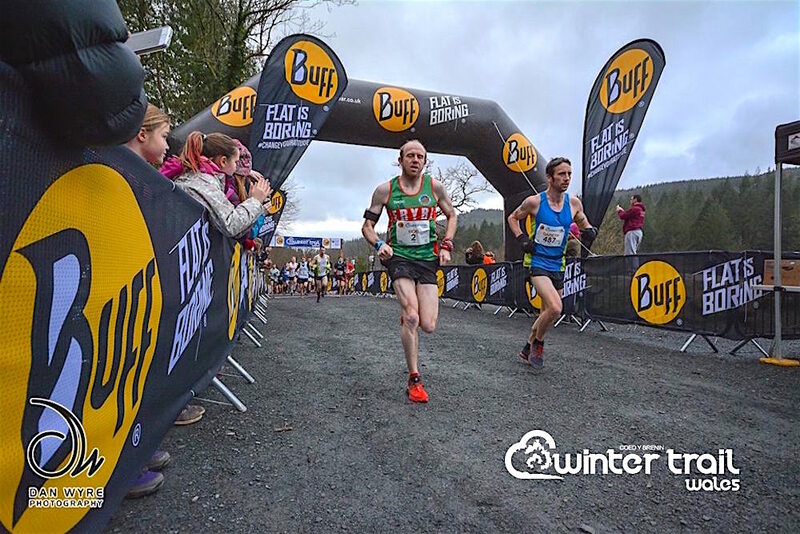 The weather was kind and the smiles were abundant as over 500 runners took to the trails of Coed y Brenin in Snowdonia on Saturday to take part in the second annual Buff Winter Trail Wales. The quality of racing was high as ever, and the masses were boosted with the excitement of running alongside former Wales and British Lion Shane Williams MBE, who was running in Coed y Brenin for the first time. In 2015 the event put winter racing on the map at Coed y Brenin with 300 plus runners taking part. As the trail running boom continues in this part of Wales the 2016 was full to a capacity 600 runners within 20 days of opening in October and the clamour for spare places continued right up until race week. After an unsettled few months weather wise in the region, hopes of perfect underfoot conditions were slim, however light winds and a dry, overcast situation ensured that racing conditions were excellent for the runners on race day. Rob Samuel had been touted as race favourite in the build-up to the event and after winning the summer Trail Marathon Wales half marathon event in 2014 the Eryri Harrier knew what was to come. As the runners wound their way through the race arena and past the award-winning Coed y Brenin visitor centres after the 10:30am start it was clear the Welshman wasn’t waiting around. Samuel is getting back to fitness after a troublesome 2015 with injury, but now running freely he quickly established a one minute lead by mile 3, this had turned into 3 minutes as he descended the stunning gladed area of Mynydd Penrhos and into the Ty’n y Groes feed station at mile 10, and by the finish his lead was to be almost five minutes as he crossed the line in 1 hour 25 minutes and 5 seconds – just 4 seconds shy of Matthew Robert’s race record. Behind there was some great competition as last year’s 9th place runner Adam Newton improved by almost 5 minutes to finish second in 1:29:45. The Swansea Harrier had come through strongly in the second half of the race to overtake Gareth Wyn Stephens who finished a solid third in 1:30:27. The women’s event was full of quality. Added to last year’s winner Vic Walls who was running once again were GB and Wales international mountain runner Gina Paletta, Welsh international Anna Bartlett and winner of the 2013 Trail Marathon Wales winner Mary Grace Spalton. Again, however, it was to be a gun to tape victory that took the day, as Paletta stormed around the course to win in 1:37:41, to smash Wall’s 2015 course record by over 7 minutes and finish a superb 10th overall. Behind Bartlett continued her return to form as she claimed second place, also inside the course record, in 1:44:30. Victoria Walls ran a strong race to claim the final podium spot in 1:47:38. “Holy legs. Today’s first race back after ten months at the Buff Winter Trail Race reminded me that nothing beats being healthy and spending time in the Welsh mountains with friends. Coming in first lady and 10th overall in a new course record was a huge bonus. Biggest thank you to Matt Ward and all the volunteers for an amazing event”. Rugby legend Shane Williams MBE was at the Buff Winter Trail Wales race for the first time, making the trip up from South Wales with his brother Dean and a number of Ammanford running friends. The former Wales and British Lion took on the Winter Trail as part of a year of adventure, as later in the year Shane will take on Ironman Wales in Tenby and finish off his year of challenges at the Snowdonia Marathon Eryri in Llanberis. Running with what appeared to be a permanent smile, Shane danced his way around the trails with the aplomb which saw him become one of the worlds greatest try scorers, finishing in a very respectable 2:17:47 on the demanding 13 mile route. “I don’t think it could have gone much better to be honest. Of course after every event we analyse where we can improve, but other than the odd tweak needed, it all seems to have gone to plan. We have a great team working on the event, and I am eternally grateful for all of the support we receive from the local volunteers, organisations and fellow runners. It was great to see Rob and Gina back running strongly too, and to have two GB and Wales internationals winning the event is very pleasing from a competition point of view. The 2017 Buff Winter Trail Wales race will take place on 21st January with entries to the 2017 event live on October 1st, 2016.